Robert Forto is the training director for Alaska Dog Works where they train dogs for canine obedience, working dogs, therapy dogs and service dogs for clients all over North America. He is also a dog musher and he and his wife operate a 40-dog mushing kennel in Willow, Alaska, called Team Ineka. They can often be seen at local races and leading expeditions in the Alaska backcountry with outdoor leadership students at the University of Alaska. Robert is the producer of Dog Works Radio that has been on the air since 2009 and is currently simulcast on a local radio station, KVRF in Palmer, Alaska. Audience feedback drives the show. We would love for you to email is and keep the conversation going! 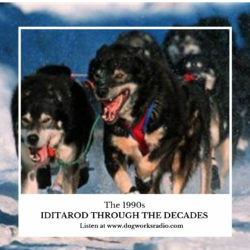 Email live@dogworksradio.com or call 907-841-1686. We would love to hear from you! If you dig this episode head over to Apple Podcasts and kindly leave us a rating or a review and subscribe! You can ask your questions, make comments and request a show topic! Let your voice be heard.